Messier 106 in the constellation of Canes Venatici is quite a spectacular galaxy with lots of interesting details, it should really have a common name given to, like in case of many other galaxies (eg. The Whirlpool Galaxy, The Pinwheel Galaxy, etc.). Besides M106 there are plenty of other galaxies visible in the picture too, some of them are so far that they seem to be a pale reddish spot. M106 was discovered by Pierre Méchain (assistant of Charles Messier) in 1782. Astronomers at those times were more interested in discovering new comets than observing deep-sky objects, so they started to catalogue objects that could be mistakenly identified as comets. Méchain discovered 26 deep-sky objects, and he was the second best of his time (after Messier) in discovering comets. The first catalogue of deep-sky objects was published by Messier, the total number of objects in his catalogue was 103, which has been complemented by 7 additional objects later. M106 was added in 1947 by Helen Sawyer Hogg. The galaxy that looks the biggest in the picture is Messier 106 (also known as NGC 4258), which is about 23 million light years from Earth. It is a spiral galaxy. Although most of the spiral galaxies have only two arms, M106 has four of them. The two main arms contain stars as usual, while the extra two of them are of gas, mostly Hydrogen. They are thought to be the result of a super massive black hole in the core of the galaxy which produces two jets of material. These jets interacts with the gases in the galaxy, making them glow in red. The inner part of the galaxy is thought to be falling in the central black hole, according to x-ray observations and the unusual emission lines of the galaxy. Galaxies with that kind of active nuclei are referred as Seyfert galaxies. M106 has also a mega-maser (megamasers are working like lasers, but operating in microwave wavelengths, and in galactic sizes). Maser of M106 was used to measure the distance of the galaxy directly, providing a good calibration point for indirect methods of determining distances e.g. using supernovae. The other dominant galaxy in the picture is NGC 4217, a barred spiral galaxy seen from the edge. Its distance is about 48 million light years from Earth. The most prominent feature of this galaxy is its dust lane of interstellar gas and dust obscuring the light of the galaxy. NGC 4217 is probably a companion galaxy of M106. The smaller galaxy close to the upper right part of M106 is NGC 4248, a small irregular looking galaxy, only a bit farther than M106. 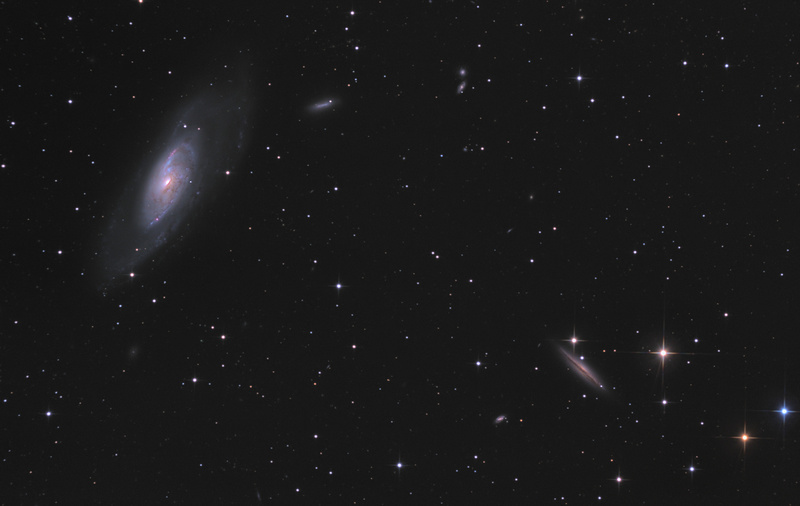 Right to them, near the top-center of the image are two spiral galaxies NGC 4131 (upper) and NGC 4132 (lower), they are about 340 million light year away from us, almost 15 times farther than M106. Above NGC 4248 a few dozen of dim reddish-orange spots can be observed, those are also galaxies, but in a much larger distance, they are about 3.3 billion light years away, approximately 1/4th of the distance of the edge of the observable universe. Colour of their light is shifted towards red due to the enormous speed they are receding at.